Ray’s Cafe, located above the well-known Ray’s Boathouse in Ballard with a nice spot on Shilshole Bay, is known for their great seafood and wonderful views. They are also one of the many outstanding Seattle restaurants that has a very solid tap list of local craft beers. 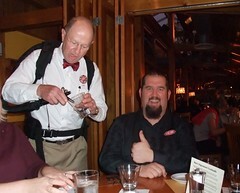 In addition, they have been holding these Brewmasters Dinners about twice a year, and Jeanne and I have been lucky enough to attend about six of them now. Most beer dinners at other restaurants concentrate on one brewery, but Ray’s is unique in that they always invite several (usually five or six) brewers and pair one of each brewery’s beer with a course. 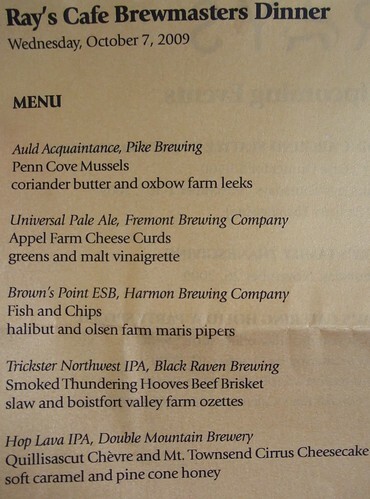 For this dinner, Executive Chef Peter Birk included Pike Brewing, Fremont Brewing, Harmon Brewing, Black Raven Brewing, and Double Mountain Brewery (from Hood River, OR). This dinner’s lineup was heavy on hop-centric beers, which made me a happy man. Peter always picks the beers first, and then pairs a dish to go with that particular beer; not the other way around. One very awesome takeaway from the dinner is that Double Mountain is exploring the possibility of distributing their beer up here in Seattle. They are speaking with various distributors, and they are also considering self-distribution (driving a truck up every few weeks). They would be another welcome addition from the vibrant Oregon beer industry. You can see a photo of the full menu below. The beer and pairing highlight of the night for me was the Black Raven Trickster IPA paired with the Smoked Thundering Hooves Beef Brisket. It was served with small potatoes in a slightly sweet onion sauce, and it was accompanied by lightly pickled cabbage and an intense, smokey BBQ sauce on the side. I’ve had the Trickster IPA before and enjoyed it, but this time it blew me away both by itself, and paired with the dish. The hops were full and fresh, the malt balance was just right…it was one of those “wow” moments you get every once in a while for sure. The Double Mountain Hop Lava that followed in the fifth course was great in its own right, but side-by-side it didn’t hold up to the Trickster’s hop flavors. I also really enjoyed the Fremont Universale Pale Ale. This is another beer that I had tried previously and wasn’t blown away by, but they seem to have dialed it in nicely. Lots of “c” hops in the aroma and taste, and just enough malt to balance. I’m not sure of the ABV on this one, but if it is close to 5%…this would make for one great session beer. Cheers to Ray’s for putting on another great dinner and showcasing some great local beers! If you’re interested in attending future dinners, I’d suggest signing up on their website for their mailing list. By the time I could get around to alerting you on here…it would likely be full. To see the rest of the photos click here. Ray’s Boathouse in Ballard is a fabulous place for seafood! It’s one of the best places to watch the sun set while eating some of the freshest fish in town!